Russell Knox tees off on the eighth hole during the third round of the FedEx St. Jude Classic. The island green strikes again. Scotland's Russell Knox splashed back-to-back-to-back tee balls on the iconic par-3 17th during Saturday's third round, opting to stay on the tee after each one rather than head to the drop zone, a meltdown of Roy McAvoy-ian proportions. 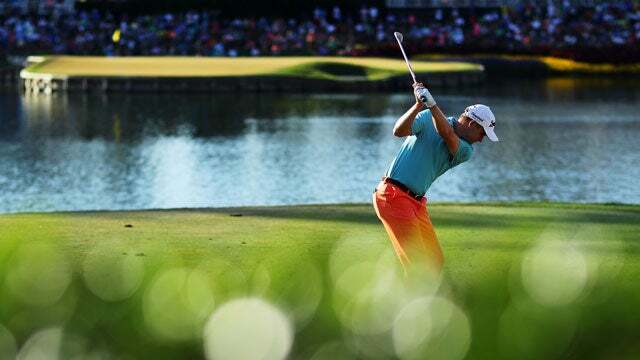 Knox finally hit from the drop zone on his seventh shot (one in, two out, three in, four out, five in, six out), which he landed on the green and two-putted for a sextuple bogey 9 en route to a third-round 80. Ouch.